Despite making mince pies the other day, I still remain largely in denial that there are just ten days before Christmas. I'm thinking of just going and burying my head under my pillow and hoping that it will all go away. The presents aren't even bought, let alone wrapped. My cards were written two weeks ago but I've still not gotten round to buying stamps. We don't have enough china or glasses. I only have two napkins to go with my festive table cloths. I still haven't found a basket to pack my father in law's hamper goodies in - and they'll all be coming from the supermarket because most of my plans to make my own things got abandoned due to trying to juggle a full time job and a toddler. I did, however, manage to order the turkey about five minutes before they stopped taking orders. So at least we won't completely starve provided I remember to cook it. 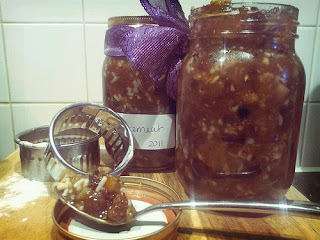 Of course, in making my mince pies the other day, I used up the last jar of the mincemeat I made two years ago. I could've done the easy thing and just bought some more, but I happened across this recipe via Diana Staveley's blog and figured I'd make my own. 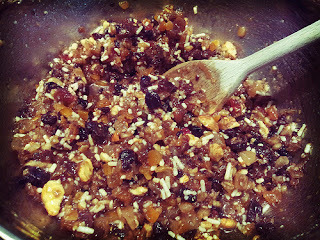 Morrisons do a good luxury dried fruit mix which I use for my Christmas cakes (I'm not making one this year so at least that's one less thing on the list). 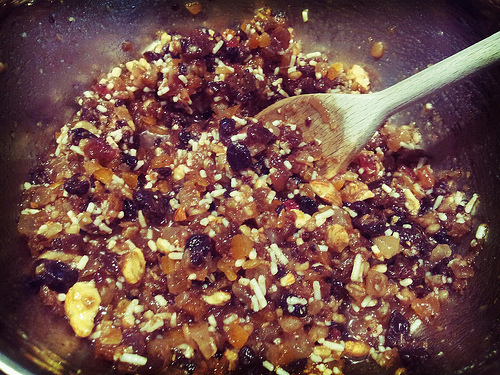 It's packed with pineapples, apricots and cherries as well as the regular raisins sultanas and currants. With one slightly bumped and bruised Bramley loitering at the bottom of my fruit bowl, clementines replacing the oranges, whole almonds in their skins and the last of my precious jar of stem ginger I've managed to at least get some homemade mincemeat made. I would say its pretty easy apart from the fact that my left index finger is hanging on by a thread after I sliced it on the blade of the food processor attachment of my Kenwood Prospero. My lukewarm relationship with that thing is slowly souring. Oh how I wish Santa would bring me a KitchenAid but until I can afford one myself it's highly unlikely. The husband hates the Prospero with a passion because it takes up too much space and makes too much noise. I like it for being somewhat useful on the cake baking front but the food processor just makes me angry and every time I use it I just end up wishing I had just not been so lazy and chopped or mixed whatever I'm using it for by hand. It's a pain in the bum to put together, a pain in the bum to clean and a pain in the bum to store. I wouldn't recommend it to anyone - if you've got the money get a more expensive Kenwood or make me jealous and get a lime green KitchenAid.